If you are searching for the best senior multivitamins, and you want only options that don’t endanger your health, but rather improve it, you’ve reached your destination. We’ve put hours into researching the market, read plenty of reviews and expert opinions, to reveal which are the most sought-after products. Multivitamins are not a whim. They can help you gain back energy, think clearer and they may even help slow the progress of some of the diseases related to older age. When it comes to good recipes, one product that stood out is the Centrum Silver Adult. It offers a balanced number of vitamins, nutrients, and minerals, it works quickly, and more importantly, it can be taken long term without any side effects. If this option doesn’t work for you, or if you need an alternative, the Kirkland Signature Mature can offer you the same benefits and quality. This unit includes 220 tablets that are age-adjustable to support the health of adults age 50+ and to help promote eyes, brain, and heart health. This is also Centrum’s supplement that contains the highest levels of Vitamin D to help with calcium absorption, as well as to promote bone growth. Customers advise that you take a look at the package carefully when purchasing this option. Many owners have reported that they received packages that were near the expiration date. With high levels of vitamin D3 in each tablet, this option is designed specifically for people age 50+. It is verified non-GMO, gluten-free, and features a smooth and easy-to-swallow coating. This product is designed specifically to support the health of seniors that lack the many vitamins and minerals required for the well-functioning of their body systems. It is quite versatile since despite it being marketed towards those over fifty, it can still be ingested by persons of all ages. Buyers have reported that the pills lack a smooth coating and since they are rather large, they can be difficult to swallow. The texture is also grainy and the pill can get stuck if you don’t drink enough water. The Kirkland Signature Mature offers great value for the money since it contains an impressive amount of 400 tablets that will help support strong bones, teeth, and muscles. This supplement contains key nutrients such as Vitamins A, C, D, E B6, and K, together with Riboflavin, Niacin, and Thiamin. All of the ingredients above will work together to support heart health, the immune system, healthy blood pressures, healthy muscle function, and physical energy. While most customers had great experiences to report about this product, we did find a few that complained about side effects such as chest pain after starting taking the supplement. The One A Day Pills stands out thanks to its affordability and the high tablet count of 250. With one tablet taken daily after food, a full bottle should last you for almost the entire year. In the following minutes, you are going to learn which are some of the most popular products on the market right now. We chose them based on expert recommendations, and because they have an extensive ingredients list that will help you and your health if taken regularly. Old age comes with a few shortcomings. Tiredness and fragile bones are two of the most recurrent ones. 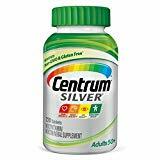 And to prevent those, and to improve the quality of your life, you need a product like Centrum Silver Adult, which offers a complete solution to old-age related vitamin deficiencies. The best thing about its recipe, is the fact that it is adjusted for men over the age of fifty, who have special requirements since men and women in different age categories have different vitamin and mineral needs. All of the carefully selected elements support the health and the integrity of your eyes, muscles, eyes and even brain. Moreover, it also has the highest concentration of vitamin D, to strengthen your bones, since it is vital when it comes to calcium metabolism. Everything about the product is non-GMO and gluten-free, and it is safe to be taken long-term with a one month break every three months. This efficient product is designed to support the ever-changing health of seniors. Due to their diet, the elderly tend to lack many vitamins and minerals, which are vital to the well-functioning of their body systems. This is why a product like this needs to be taken regularly because they will only benefit from it. It is marketed towards those over fifty, but it can be ingested safely by all age categories and by both genders. Moreover, since sometimes older people also suffer from memory loss and forget to eat, this vitamin supplement fills the nutrient gap that appears when there’s inadequate nutrition. As a general note, it supports bone integrity, prevents teeth loss and powers up your muscles so you won’t get tired just from moving from place to place. It will remove the cloud of dizziness you feel when you wake up and will give you back some of the joy to live. Furthermore, it provides effective antioxidant support. Men shouldn’t be ashamed they feel tired and weak. To give them back some of their power, the manufacturer created this innovative product, so men find the support they need. It has plenty of efficient elements to combat even persistent symptoms like fatigue. Some of the most popular ones are calcium, great for bones, teeth and muscle contraction, magnesium, which is a potent cardiac protector, and vitamin C, which is used by your body to fight all micro-aggression that bombard you every day. With the help of One A Day, you will be able to get back in the game and do all the things you avoid doing because they tire you. Since it has magnesium, it can be taken safely if you have high blood pressure, although it is not a treatment for the condition. The vitamins also help support a healthy and vigilant immune system, and cellular energy production, so all the viruses and bacteria that you get in contact with will be dealt with without any repercussion. If you or your elderly parents are looking for something that offers whole body support, give this product a chance. It comes with 90 tablets, which are more than enough for two months of daily use since the manufacturer recommends you take one a day in the morning. If you feel the need for more, you can take up to three pills a day, after your main meals. All the minerals in this recipe aim to improve your immunity, heart, skin, bones, eyes and all the other organs that are under of a lot of stress due to age or a stressful job. The recipe is specially created for seniors since it packs many nutrients and some probiotics, which are great when it comes digestion. This contains superfoods, meaning it packs plenty of nutrients, which are concentrated, and it includes many types of vitamin B, which are neurotrophic factors, ideal against tiredness and memory loss. Additionally, it rocks CoQ10, which is efficient when it comes to skin integrity and against wrinkles. The formula is created for gentlemen over the age of fifty, and for their specific needs. It contains both minerals and vitamins, for complete coverage of the spectrum. Forget your age by taking the pills regularly, for a boost in energy and confidence levels. It is formulated to target each major organ, and it contains seven antioxidants that fight toxins and support cell health. Take this every day, and you will see changes when it comes to your sleep and overall mood. You can also combine the vitamins with a better diet and with drinking plenty of water. The product is non-GMO, and it doesn’t contain any element that could potentially damage your health in the long run. It is also a great solution if you’re looking for something to help you with stress management and chronic fatigue. Women of all ages are known to have different energetic and nutritional requirements due to their particular anatomy. And this trusted brand takes that into account by delivering an efficient product that matches all of those needs perfectly, without missing any area or body system. It is a natural menopause support system, ideal for people over forty, which doesn’t contain any iron. There’s no soy in the recipe, which is great news if you are susceptible to allergies, and one pack includes sixty capsules, more than enough for two months of continuous use. The ideal dosage is one pill a day. Some of the main ingredients are vitamin A, B, C, D, minerals like calcium and magnesium, and many antioxidants. All these elements help you gain back energy and boost your immune system in its fight against pathogens. Additionally, the recipe includes no preservatives, artificial coloring or other potentially harmful things. Fermented might not sound good to some, but the truth is, this is a good thing for those over fifty who have a slower metabolism which could use a little boost in order to prevent constipation and its associated complications in old age. This multivitamin complex contains many beneficial probiotics and nutrients but is entirely sugar-free. You can even take the pills on an empty stomach, every single day, without having to fear burns and aches. It doesn’t get any more convenient and efficient than this. It includes stress support, vitamin A, and D3 for health integrity, selenium for a well-functioning prostate and many vitamins B for improving your energy levels. It relies on the power of superfoods like turmeric and ginger, and to take things even further it also takes advantage of saw palmetto and its anti-inflammatory properties. Most people are used to vitamins coming in the shape of pills. But this product shakes things up and brings a powder form to the public. You can, if you want, mix it into your morning smoothie without fearing it will change its taste too much and make it undrinkable. It is specially designed to fit a senior’s metabolism, and it contains many vitamins and minerals which let you enjoy your active lifestyle without tiring from the first few minutes of a stroll. The original formula includes all kinds of active ingredients such as Co-Q10, not unlike other brands. Additionally, it takes advantage of the powerful Ginkgo Biloba, which increases mental alertness and stimulates blood flow to the upper extremity, including to your brain, thus improving your cognitive abilities. The dosage itself is convenient, and the powder makes the product easy to ingest, especially if you have a sensible esophagus that makes pill-taking a burden. Efficient women’s vitamins are hard to come by. If you’ve been looking for a while and came up with no result, this product might fit the bill. It is packed with superfoods, vitamins, minerals and even probiotics, without relying on sugar for energy (sugar isn’t included in the recipe). For convenience, you have to take only one pill a day. The pills which are very easy to swallow due to their ergonomic shape. If you are a woman over forty, the vitamins are going to become your greatest ally since they pack vitamin D3, C, and A, zinc for immune support and many B’s for energy and a clear mind. The taste too is better than you might think, because of the ginger in its composition. It also features turmeric and fenugreek, all of which are whole foods, for balanced nutrition and a healthy lifestyle. When it comes to a complete solution for some men’s health problems, this product takes the crown. It is formulated for men since it doubles up as a prostate health supplement. This is achieved through its main ingredients like vitamin A, selenium, lycopene and zinc. Additionally, it also has vitamin E for a memory boost. Besides offering prostate support, it also contains organic whole foods for proper nutrition. The live probiotics will help those with a lazy GI tract and will prevent constipation and maldigestion. Every ingredient comes in balanced quantities so you can take this product every day, without any issue. The bottle has 120 capsules, which is plenty for three months of use, so you won’t have to make frequent buys. The synergistic blend of minerals and vitamins will give you peace of mind, knowing that you have your back covered and that a common cold day is not going to overload your immune system. If you suffer from food allergies, this one’s for you. It has no artificial color or flavor added to the recipe, it contains no yeast, and it is gluten-free. You can hardly find another product on the market that is safer to ingest. However, to be covered, read the ingredient list, to see if you are sensitive to any of them. The product can be taken daily, even for long periods of time, but ask your GP when it’s recommended to take a break, as vitamins need that in order to be efficient. It works wonders when it comes to the health of your major senses, including sight, and the non-GMO ingredients are bound to give back some of the confidence you lose when you’re tired. Specially formulated for women of all ages, Nature Made multivitamins work from the first pill you take. Moreover, the manufacturer respects every health standard, to deliver a product that will satisfy all your needs. The supplement is a wish come true for many women who suffer from deficiencies or for those looking to help their bodies work better. You can take the pills daily, to face stress and to successfully fulfill any task, no matter how much energy consuming it might be. The product has a fabulous taste which will make taking pills delightful, a thing that will stimulate you to ingest them daily, thus increasing the supplement’s efficiency. It contains no traces of stimulants or caffeine so that you can rely on its organic recipe without fearing you’ll gain weight. In its composition, you can find over twenty-six fruits and vegetables, which offer you a natural boost in energy levels. This recipe is balanced, and it has a kick to it given by the abundant vitamins, especially the B vitamins, which feed your nerves and speed up your synapses. Nature’s Wonder offers quality and efficient products that are made in FDA audited facilities, so you know you’re getting safe pills if you opt for this one. Moreover, the bottles are packaged under the Good Manufacturing Practice standards. The ingredients are selected to offer maximum benefits at a reduced price tag, which matters when it comes to pills you have to take for a long time. The comprehensive recipe makes use of vitamins A to E, lutein for eye support, zinc, and magnesium. Additionally, it has a large quantity of vitamin D3 and calcium, all so you can keep your bones healthy and so you can enjoy taking walks with your nephews even at an advanced age. Not a single body part remains unchecked, meaning this trusted product could offer complete coverage for your health. Take these multivitamins as part of a natural and healthy diet, add an exercise routine to the mix, and you will delay some old age mishaps. Men over fifty experience many health problems, especially due to their enlarged prostate, a weakened body, and an overall decrease in energy levels. And this item promises to help them gain some of that back. The recipe is formulated for their physiology and age, and it features many vegetable and fruit extracts. It is comprehensive, as it has more than twenty vitamins and minerals in its composition, including the ubiquitous vitamin B, which will feed your brain so you can feel young again, especially when you wake up dizzy and a bit confused. If you are a vegetarian, you can take the product without worrying, since it has no animal component. It is gluten-free, without any added artificial flavoring or dairy products. It is preserved without the aid of chemical preservatives, and it has no allergen like soy or egg included in the ingredient list. If you are in the market for the best multivitamins for seniors, there are a few things you need to consider before buying the one that caught your eye. Besides paying attention to the brand, because everyone wants to buy from trusted manufacturers, you also need to make sure it has vitamins like A, B and C, and minerals like calcium and magnesium. You also want to check that it features something extra like whole foods and probiotics. It is not mandatory that it has all of them in its recipe, but it should at least feature something for each organ. What vitamins should it have? The answer to this question is easy, senior multivitamins reviews reveal. It should have plenty of those vitamins that you need. For this, you will have to take a moment and think about why you require multivitamins. Most seniors need them for clarity and because they are tired all the time. For that, the product you buy should at least have a vitamin B complex. If you suffer from any cardiac pathology such as high blood pressure, then magnesium and calcium are your best allies. Calcium is also ideal for your bones, especially if you combine it with vitamin D3. The good news is that most manufacturers include all of these in their main recipes for sale. This is why these products are such beloved gifts for retired men. Zinc is also a beneficial element. Its role is obvious when it comes to your immune system since it helps immune cells like macrophages kill bacteria more efficiently. Thus, a good multivitamin should cover the entire spectrum of old age-related issues. If the ingredients come from organic sources, that could be a bonus. This should matter only if the product contains whole foods, which should be non-GMO and grown without the help of pesticides, for maximum results. When it comes to the brands of the best multivitamins for the elderly, things tend to get a little gray. Multivitamins work well because most contain the same elements: minerals, vitamins, whole foods and the extras such as probiotics and ferments. This means that even if you buy a low-cost product, it will most definitely work, even if somewhat slower. This principle should not be applied when you want to buy new and improved senior exercise equipment. The difference between big name brands and unknown creators, besides the fact that the first ones are more expensive, is that big brands have modified elements which are absorbed faster by your intestines. Thus, their products will work quickly. However, if you take the vitamins long-term, the difference is not that noticeable. Another important difference is that manufacturers who have more money will usually include more ingredients in their recipes, which is good for your health. But then again, you need to think if you require those bonuses and if they are worth the money. It’s the same as if you were to buy a comfortable wheelchair cushion – sometimes you just need something simple. According to experts in the best senior vitamins field, whole body support is preferred, but only if your diet is inconsistent and chaotic. If you can get some of the microelements from the food you’re eating, then a multivitamin that packs only half the letters of the alphabet might not be such a bad idea if you’re on a budget. Much in the same fashion as osteoporosis treatments that actually work. The first bonus the best elderly vitamins should contain is probiotics. Of course, you could buy a separate product which offers you a higher quantity of probiotics, but that means spending more money and ingesting two solid pills which could be unpleasant. Probiotics are great if you have a slower metabolism and if you get constipated easily. Match all those benefits with some efficient wrist blood pressure monitors. Next, see if the recipe includes something useful for your prostate function. Just like with the first item on this list, you can buy a separate prostate health supplement that will probably do a better job. But if it’s included in the price of the multivitamin and if you’re a man, then you are making a good investment, and you can even give this to your dad or grandfather as they make thoughtful granddad gifts. “Woman recipes versus men recipes” is a debate that has been going on for a very long time. While it is obvious that women have a different anatomy than men, thus distinctive needs, it is not so sure if multivitamins targeted directly to one gender are making a huge difference. The only ones that do are the supplements that include lycopene for men’s prostate and a double dosage of calcium for women at menopause. Furthermore, the market for good vitamins for seniors is abundant with options that work great with both genders, so if you have a big family, you can buy the same product for everyone. Whichever brand you choose, we have to applaud you for investing in your health, since many older people ignore all the amazing benefits these health supplements offer, just like they would do with the most efficient and cheap prostate health supplement.